You review your work. Why not review your life? With every new year comes the feeling that you’re starting with a fresh, clean slate. It’s likely that you spent the holidays eating, drinking, dancing and celebrating with the people you care about most. What went well? What were your major accomplishments and/or magic moments? What didn’t go well? What old habits are still preventing you from a break through? The problem is, most people never, ever bother taking the time to write it all down and actually get it out of their heads. But, you’re different. That’s why you’re reading this. An Annual Review is a chance to really sit down and dedicate some time to yourself. Every week, I sit down and give myself one hour to review the previous week and plan for the next (one of the most powerful new habits I formed this year). But this is different. I’m talking about dedicated time in solitude. One day to review your year, and another day to plan ahead for the next—in detail. 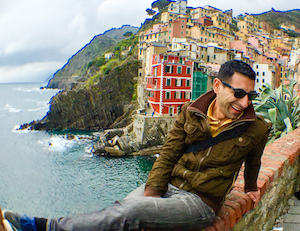 Is this the year you travel more? Will this be the year you finally decide to start that blog, or build that business and live your solopreneur dreams? This simple act of living intentionally, thoughtfully, and proactively instead of reactively, will give you massive gains and success in life. In fact, there isn’t a single successful person I know that doesn’t do their own Annual Review (in one form or another). I first learned about this idea over brunch from a good friend of mine. He explained that he’d recently become friends with a billionaire, and that he really looked up to the guy as a mentor. “Every single year, I gift myself two days of complete solitude. I spend the first day reminiscing, celebrating, and reviewing the previous year. I make sure to really relive the experiences and feel the joy in each accomplishment or magic moment. I then sit down and truly examine what I could have done better, and what the root cause of these problem areas was. All of this, every single thought, gets put down on paper or in a digital document. And finally, I take all that energy from the first day and put it into my plan for the next year. I strategically plan out my goals, make them exciting, and find ways to out leverage on myself to making them happen. There you have it, my friend. An annual review. No matter when it is you’re reading this, it’s never too late to do yours. Ideally you perform this at the end or beginning of the year. However, what matters is that you do it. This will separate you from 95% of the rest. The Annual Review is one of the things I look forward to the most every year, and I truly enjoy the process. Note: You can do the Annual Review and Annual Planning at any time, it doesn’t need to be the end or beginning of a year. With that said, I’ve created some templates that I’m going to share with you to help you get started. I used to just jot everything down without any structure, but having these templates has dramatically improved the process for me. I’ve adapted a planning template based on one Chris Guillebeau shared on his blog, and then created a separate one for the review stage. 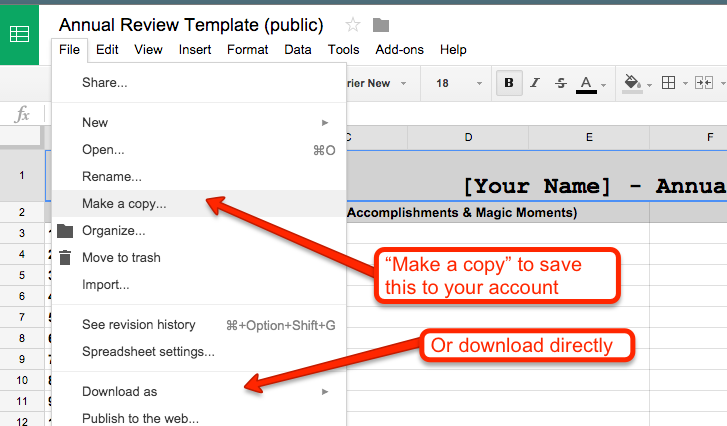 This image shows how to save or download this Google Sheet. Remember, the most important thing is that you just take the first step and do this. After you complete your review and planning process, open up the docs again in 3 months and see how you’ve progressed. Are you ahead of schedule? Are you still stuck on some old habits? Be aware and make small adjustments as needed, then move forward again. At the end of the day, it’s all about moving forward, and living purposefully. If you found the templates and Annual Review helpful, get access to my VIP Insider Insights to receive free resources like this you won’t find on the blog. Do you know someone who could benefit from doing an Annual Review? Pass this article along so they can download the templates too.